Full of twists and turns, High Crimes is an intertwining and engrossing read. 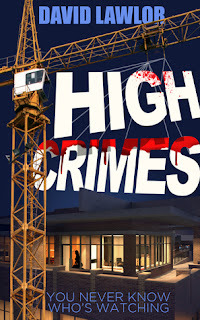 Set in Ireland, twenty stories in the air, the operator of a construction site is, literally, a Peeping Tom. Tommy's victims are quite different. The men and women he watches have strange habits. Soon, watching is not enough. Tommy begins to record and follow them, and then insinuate himself into their lives. What is set in motion is a change of events that brings murder, love, and a cold case to the surface. The story has so many crazy twists and turns it kept me flicking pages just to get to the next revelation. The author does an amazing job of interweaving this tale. Well written with complex characters and lots of action and mystery.